The Board of Education and district staff are concerned about the health, safety and well being of your child. It is the policy of our school district to provide a school environment, which is conducive to the growth and development of our children. Our school health program meets the requirements of the Regulations of the Commissioner of Education and is designed to include health services and health education. The program’s major objective is to promote a sound mind in a healthy body. The following is general health information for your reference. The same information is available in the school district calendar. 2. The nurse must receive written permission from the parent/guardian to give the medication. 3. The parent must bring medication to the school nurse in the original container or prescription bottle. 4. Medications cannot be brought to school, or returned home, with the child. 5. Children are not allowed to carry medications to school, or on the bus. 6. Forms to be completed by your doctor are available in the school Health Office. Please contact the Health Office at your child’s school if: he/she is on medication at home which may have possible side effects; or if he/she has a newly diagnosed health problem. Communicable diseases affect the entire community. They must be controlled at home. Immunization is the best method of control against some communicable diseases. It should be given early in life and periodically thereafter. New York State requires an annual survey of the immunization records of all school children in the state. It also requires that all students, new entrants (this includes students beginning kindergarten OR any student entering Maine-Endwell Schools for the first time at any grade level) and current attendees meet the NY State immunization requirements. 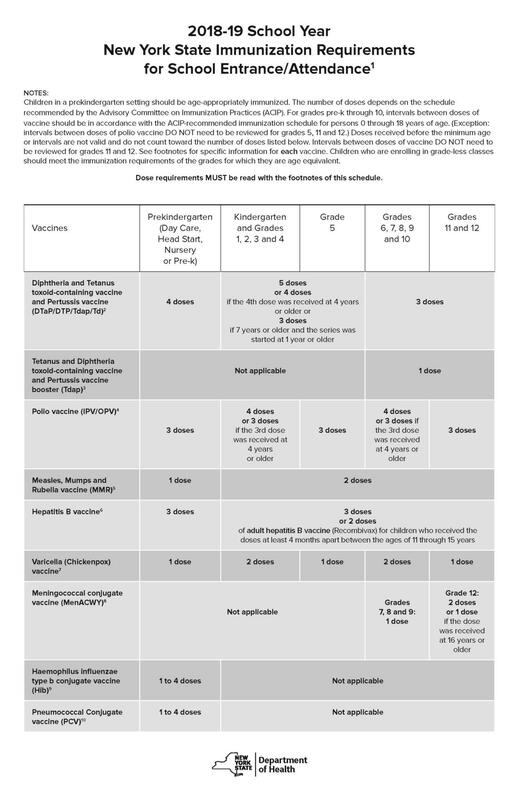 PLEASE NOTE: An official physician copy of varicella (chickenpox) vaccine is required, as well as proof of chickenpox disease as documented by a health care provider. In addition, medical exemptions must be renewed each year. Those children entering the M-E district from another state, and those entering Universal Pre-Kindergarten, Early Kindergarten or Kindergarten. • Those children in grades 1, 3, 5, 7, 9, and 11. • Sports physicals are required for all students in grades 6-12 who participate in after-school sports programs. Students should check with their school’s health office prior to their sport season to verify if they need a sports physical. Fall sports physicals are done the preceding June. The New York State Health Department has requested that school districts provide residents with information about Ebola. What is Enterovirus D68? What are its symptoms and how can you prevent your child from contracting this respiratory illness? Here is a guide to help parents keep their child well during flu season.